The Portmeirion Weekend in November is becoming an established event in the calendar for folder enthusiasts. The brief photo report below describes some of the goings on at the 1998 event. Plans are already afoot for the 1999 event, so if you don't want to miss out (the 1998 event was over-subscribed) you'd better start making your booking for 1999. Although the weather was rather murky and dismal on the journey down, the atmosphere in the train was much more cheerful. Not everyone was on the same train, but a good contingent managed to catch the 10.16 from Birmingham New Street. Pictured here are David Henshaw (left), David Lyons (reading up on how to use his video recorder), and, lurking in the background, apparently dunking her biscuit in her coffee, Jane Henshaw and her huge roll-top bag. Before the Friday evening meal, and before the bikes moved indoors, David Hanshaw furtively smokes a cigarette, watched disapprovingly by Bromptons and a Birdy. 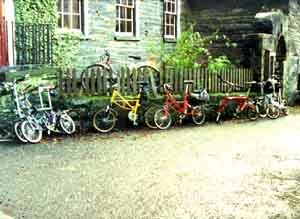 Nine of us and our bicycles were staying at Chantry. 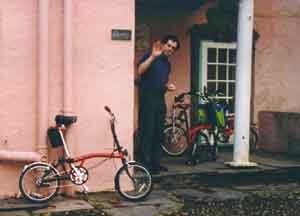 A highlight of staying there was the cooking of Janette and David Edge - the more cumbersome bikes such as the Moulton Stowaway, Birdy and Fold-It were not allowed into the kitchen until the meal was over; the more compact Bromptons (6 of them) fitted into a corner. 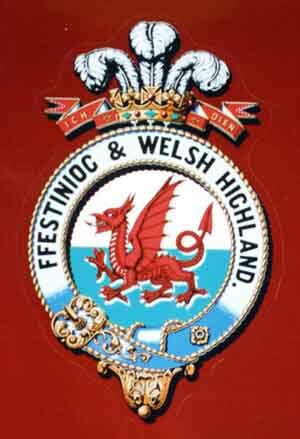 By general agreement the theme for Saturday was the Welsh Highland railway. Most people cycled to Beddgelert for lunch, some following the old route of the railway, while others took the rather simpler main road - almost traffic free at this time of year. After the lunch stop people followed their own routes back to Portmeirion - some going straight back, while others followed the old railway route further, or explored the countryside. A Welsh Highland Railway station and a short length of track can be found in Porthmadog, although it was not running at this time of year. However, the main activity of the new version of the Welsh Highland railway is based at the other end of the line, starting at Caernarfon. One antisocial/intrepid individual (me) decided to cycle straight there, rather than go to the lunch stop. 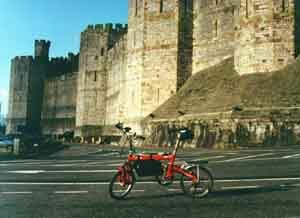 Here the Birdy is pictured outside Caernarfon Castle. The WHR station at Caernarfon is rather unimposing - just a platform - particularly at this time of year, when no trains are running. However, there is a well-made cycle track running all the way from the station at Caernarfon to the other end of the WHR line at Dinas. There is a lot of building going on at Dinas, with two substantial platforms and what looks as though it will be a substantial shed for locomotives/rolling stock, although the site was deserted on this visit. Although the line currently stops at Dinas, I understand that, if permission is granted, it is hoped to have the line open all the way to Porthmadog by 2005. 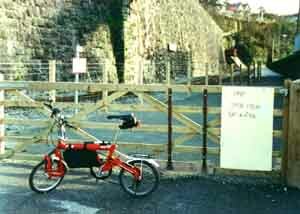 The cycle track continues most of the way to Porthmadog, and most of the way the surface is tarmacced. 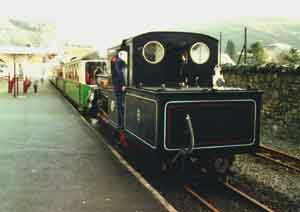 The theme on Sunday was again railway related, starting with a trip on the Ffestiniog railway to Blaenau Ffestionog. Most people chose to cycle down to Porthmadog to take the whole journey, though a few joined at Minffordd, which is closer to Portmeirion. 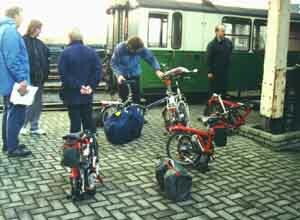 here some riders and their cycles await the departure from Porthmadog, watching Rob Cope demonstrate how easily the Tactic folds. 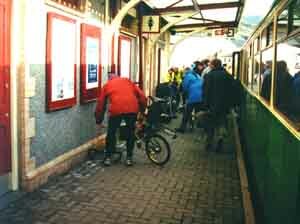 On arrival at Blaenau everyone hurried to get off and reassemble their bicycles ready for the exhilarating descent back to Portmeirion. Most people set off from Blaenau immediately, but I stayed to watch Linda depart tender first taking the train back to Porthmadog. 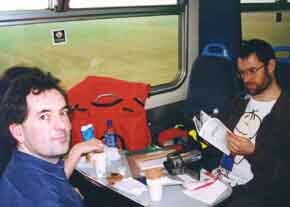 A few members of our group chose to stay on the train for the return journey. At the end of the main descent is the village of Maentrog, and as I rode through I came across this group of folders parked outside a feeding spot - obviously the effort of cycling down the hill had created an appetite for most of our group. On the left are the tactic and Birdy Blue of Rob Cope and David Lyons, followed by the yellow Moulton APB of John Bradshaw, the red AM7 of pat Strachan, my Birdy Red and two other machines (one a Bickerton) of unidentified riders. 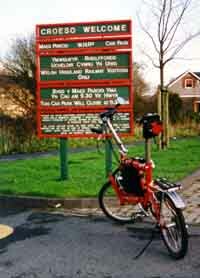 Where were all the Bromptons? 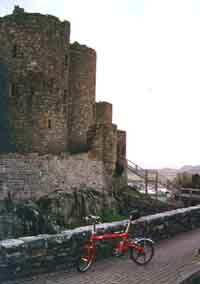 Once again I chose to forgo sustenance, and instead cycled on to Harlech to see the castle, which I can't recall ever having visited before. This was a most enjoyable weekend, and despite the poor start the weather was excellent for most of the time. 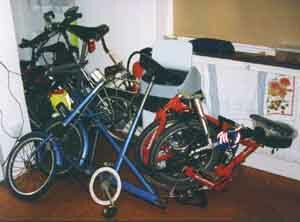 The variety of bikes was rather greater than in past years, as one of the photos shows, although Bromptons were by far the most common machines as usual. 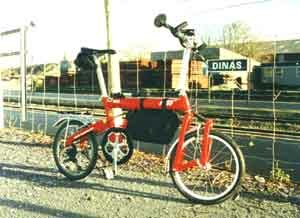 The first year I took a Bike Friday, the second year I took a Brompton, and this year it was the Birdy. For the riding I did, and the amount of folding and unfolding involved, the Birdy was the best compromise, and it behaved perfectly throughout the weekend. I took a digital camera with me to produce picutres for these web pages, but in the end all the pictures you see here were shot instead with a Yashica Samurai half frame camera. Now I'm eagerly looking forward to next year's event.